i recently got a commission to do a small painting for a Parisian dude. 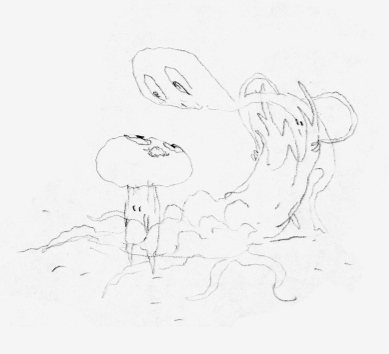 he didn’t have a specific idea, so as i often do, i just emailed him half a dozen JPGs of loose doodles. 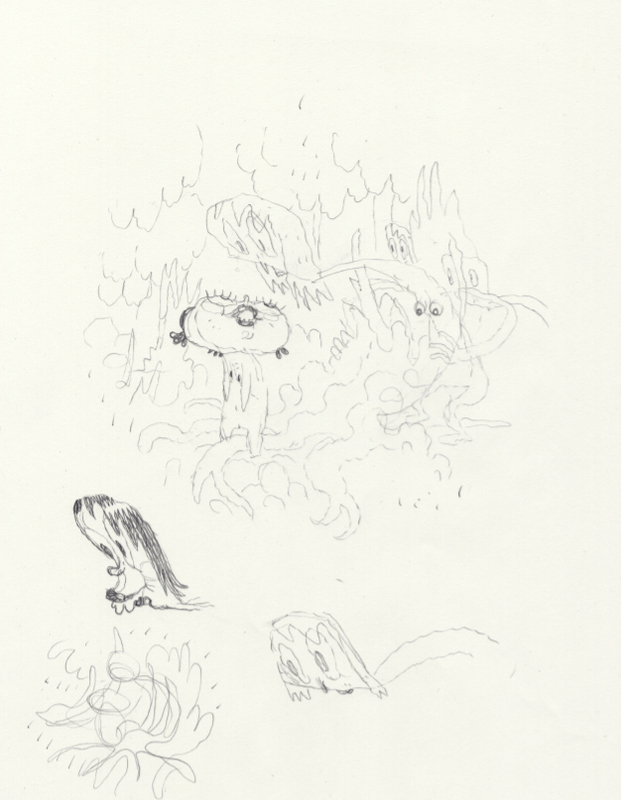 i’m always coming up with little thumbnails– there are always more than i can ever seem to get to. so when someone wants a commission, it’s great to be able to dig up one of these little gems that i’m already eager to make for “myself”. here’s the one he chose. the size was to be around 2 x 2′. next i needed to flesh it out a little for final approval, and so that i could figure out the character details and what kind of environment they were in. 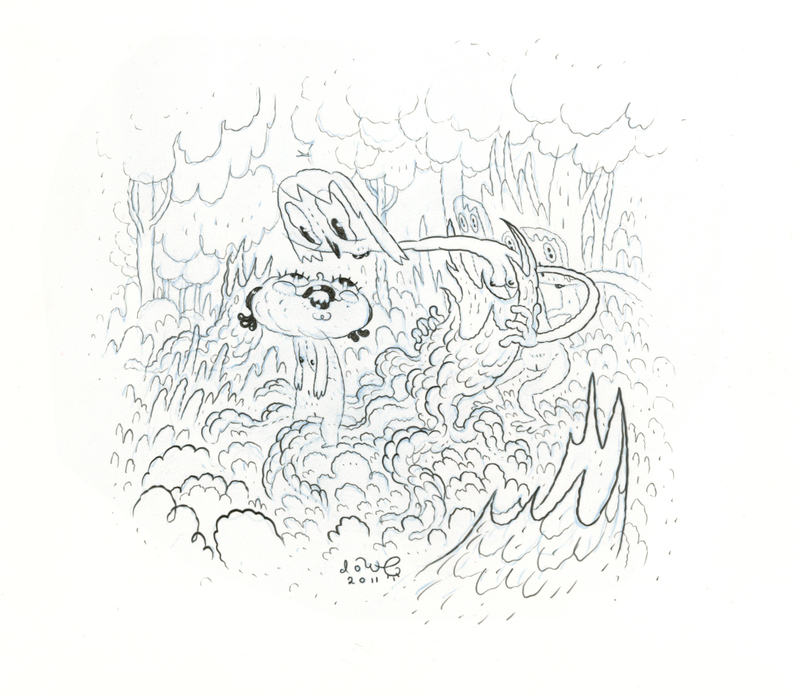 the buyer loved the sketch so i printed it out on really nice Yupo paper in super-light blue. that’s when i re-draw the sketch as definitively as possible. this is the drawing the i project onto canvas to re-draw to size– so at this point i don’t want there to be too much guess work. i still like it to be kind of loose so there’s room for interpretation, but within that looseness i need to feel like it’s “whole”– fully realized. next time, i’ll transfter the drawing! The atmospheric landscape you build reminds me of a mashup between, what I imagine the inside of a uterus to look like(the safe zone lining for eggs to attach too), and if brains had cotton candy clouds of inflated latex custard skins. dude! did you lift that from the artist’s statement that exists only in my head? Love the process shots. You should put them all together in one post so we can see beginning to end all at once. keep up the good work!